Every year in Johnson County, between 200 and 250 people leave prison and re-enter society. At a parole simulation on Wednesday, more than 50 elected officials, landlords, business owners and community members got to experience that process firsthand. 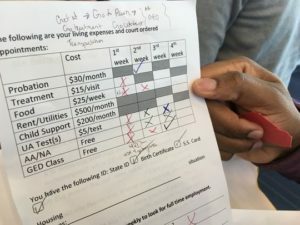 The simulation gave each participant a fictional character and forced them to navigate the obstacles that former inmates deal with while they get their lives back on track — things like checking in with a parole officer, going to court, obtaining an ID, passing a drug test, applying for rent assistance and going to counseling. At the end of a “month” in the life of a parolee — represented by four, 15-minute “weeks” — more than half the participants in the event ended up in jail. For many, the experience was frustrating. “Why do I need to get food? I can starve,” said Jasmine Porter, one of the participants. Porter, who is pursuing a master’s degree in social work from the University of Iowa, said she’s not surprised by the challenges, since she’s seen them in her role helping others navigate social services as a minority family advocate. Still, she said the simulation showed “how easy it is to get broken down and to just give up” for someone who’s experiencing those obstacles. Seemingly simple things like getting an ID or finding transportation around town were surprisingly difficult, many people said. Another challenge? Learning to use new technology like cell phones that didn’t exist when people began their prison terms, said Anthony Upchurch, who spent 15 years in prison in Illinois. 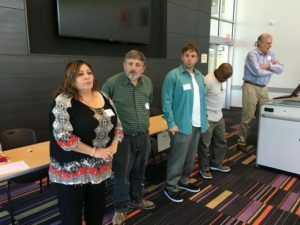 Upchurch spoke at a panel of former inmates after the simulation. Participants found themselves making choices that surprised them. Some quickly gave up on finding housing, preferring to use their limited time and resources elsewhere. One man said he got someone to cover for him so he could sneak out of work and run errands that would send him back to jail if he didn’t complete them. “I turned into a mean person,” one woman said. Letisha Molina, who spent time in prison in Arizona and is now a volunteer with Inside Out, said she understood the participants’ frustration. 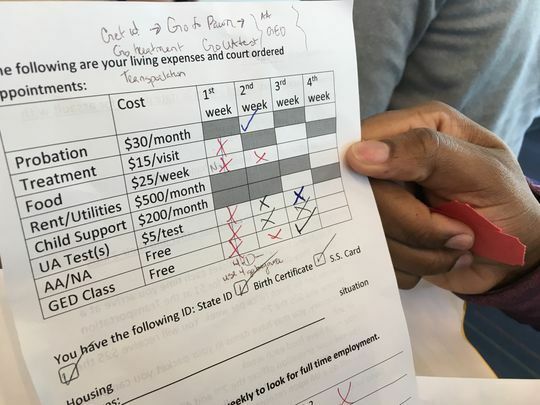 Molina worked at a mock social services center during the simulation and said she knows applying for programs like food assistance can eat up valuable time out of the day. “You’re going to be there for half an hour waiting to be approved,” she said. 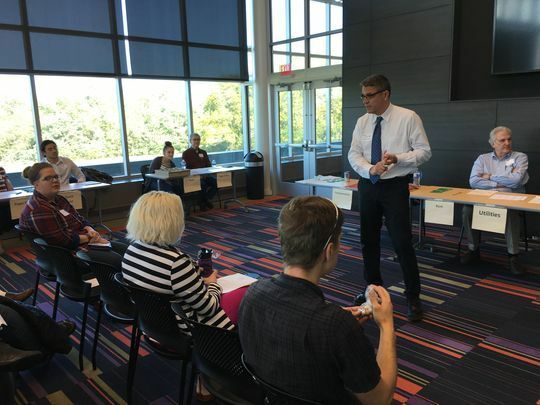 The simulation, held at Kirkwood Regional Center at 2301 Oakdale Blvd. 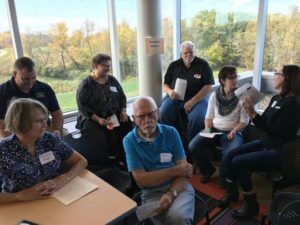 in Coralville, was put on by Inside Out Reentry Community, ReEntry Network and IowaWORKS. Richard Grugin, an Inside Out volunteer who helped plan the event, said he hopes to hold future simulations targeted more specifically towards landlords and business owners. Don Ross, who sits on a Johnson County foster care review board, said he heard about the simulation through his church and wanted to participate. “You can understand a little bit more about what they go through to get their lives straightened around,” he said. For Ed Cole, it’s something he’s experienced firsthand. Cole is the owner of Cole’s Community, which operates four mobile home parks in Iowa City and one in Kalona. He also served 47 months in federal prison a decade ago on a drug conspiracy charge. He said he never sold drugs, although he was addicted. “It’s tough when you come out because people are stereotyping you and a lot of people aren’t forgiving,” he said. He said he straightened himself out in prison and had the support of family and a church group when he got out. But for people without that network, it’s hard to reenter the community, he said. Programs like Inside Out that connect people with resources when they leave prison can help, Cole said. So can landlords and employers who understand the difficulty of finding housing and work and don’t prejudge people.